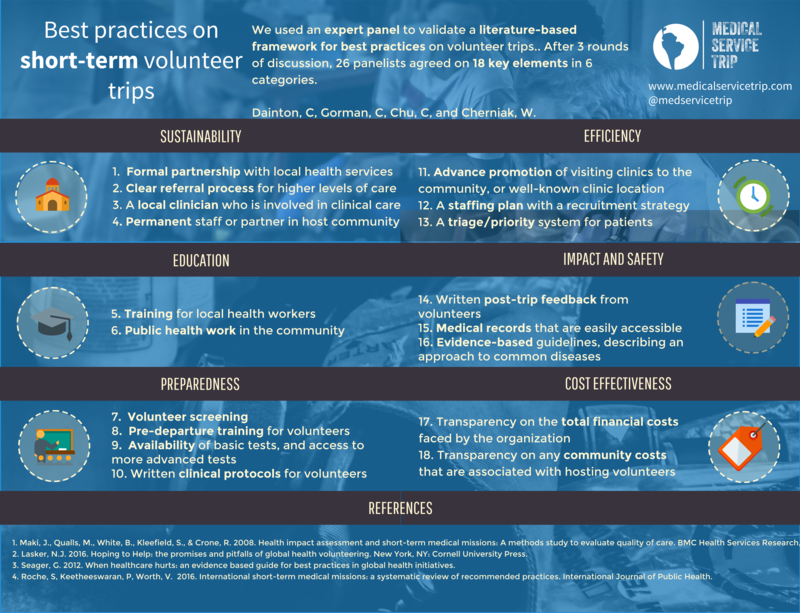 We want to make sure that volunteers have access to reliable information about the quality of the global health experiences and volunteer projects they are signing up for. Thanks to grant support from the Pollination Project, we’ll be pushing forward by evaluating over 300 groups sending medical service trips and medical missions to Latin America. Our best practices framework is the first step in this direction, and we presented it for the first time at the Waterloo-Wellington Quality Improvement symposium. You can find the summary infographic of our findings below. In our “virtual round table”, 26 experts reviewed a list of best practices found in the medical literature. They agreed on 18 practices that should be considered important for high quality global health experiences. Can these 18 elements be reliably assessed by volunteers and program administrators? And will NGOs be receptive to an objective audit of their strengths and weaknesses? We hope the answer to both these questions is an emphatic “yes”. If you’ve traveled on a short-term medical mission or global health experience, you can find your organization in our directory. You can help future volunteers (and critically assess your experience) by answering a simple 5 minute survey.